While watching this movie, I was convinced that as a preacher, Pastor Chris was a great wrestler. We hear his first sermon to his first congregation (they seem to have hired him without hearing him preach), and it’s pretty awful. He brings note cards to the pulpit and sorts through them as stands in front of the congregation. His topic is faith. “Faith is good… Faith is great!” You need to go to go to seminary to come up with that kind of insight. Chris’ wife, Michelle (Lara Jean Chorostecki), and young daughter, Carrie, are watching the match, with Michelle assuring Carrie that the moves are all fake and that it’s all just a performance; her dad is an actor. But The Reaper cheats and breaks the Masked Saint’s leg, so Chris goes off defeated (and on crutches) to his first job as a pastor. We learn that Chris (Brett Granstaff) was hired, apparently sight unseen, by the search committee of Westside Baptist, somewhere in Michigan. That search committee apparently consists of two people, the church treasurer and Mrs. Beasley, the deaf choir director, organist, and finance chairwoman. 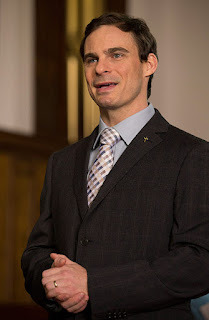 Chris was hired while Judd Lumpkin (Patrick McKenna), the chairman of the church board, was out of town. Lumpkin is also the primary financial backer of the church. Lumpkin seems more interested in Chris’ athletic skill than in his ministry skills and asks him to play on the church basketball team. The team loses, and Lumpkin and Chris fight. 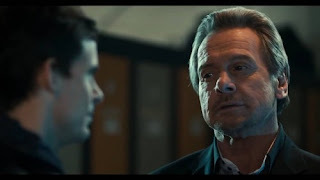 When their verbal fight becomes a physical one (with Lumpkin losing badly), the law enforcement team the church has been playing against aren’t impressed with the church’s Christian witness on the court. Like pretty much everybody in the congregation, Lumpkin is not impressed with the pastor’s preaching. In fact, half of the congregation walks out during his first sermon, not because they’re offended, but because of his quite evident incompetence. He must have missed all the homiletics (preaching) classes in seminary. One of the few people who supports Chris is Miss Edna (Diahann Carroll), someone who knows the church and community well and happens to be a big wrestling fan. She encourages Chris to get to know the neighborhood, so he and his wife go door-to-door. Everyone slams the door in his face except a battered wife named Mindy, who invites them in (until her husband comes home and tosses them out). The only place Chris seems to find success is in crime fighting -- not something usually found on a pastor’s job description. When Chris sees a pimp threatening a woman, presumably one of his “girls,” the pastor puts on his wrestling mask and beats the man up. He tells the woman to go to the nearby shelter for help. The prostitute, Valerie, comes to church the next Sunday, and it isn’t long before she figures out that the pastor and the masked vigilante are one and the same. 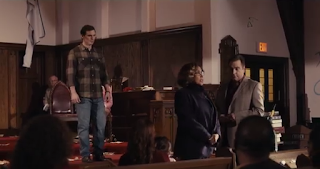 Initially, the congregation doesn’t treat Valerie well, pointing at her and whispering. Chris reprimands them and tells them to treat Valerie as Jesus would. This is really one of the pastor’s finest moments in the film. Valerie invites her friends to the church and soon the church fills with the underclass of the community. In time, Chris becomes a better preacher. And the pews again fill up with parishioners. Unfortunately, the church faces ongoing financial woes, increased when a local gang vandalizes the church to avenge the pastor’s crime fighting. 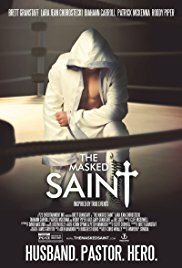 Will Pastor Chris return to the ring one more time as the Masked Saint to raise the funds for the church and avenge his loss against the Reaper? Perhaps -- if you have ever seen a motion picture -- you can make an accurate guess about these things. 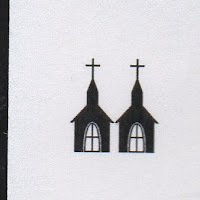 Usually what brings a church’s steeple rating down is moral or theological failings. At Movie Churches, we’ve reviewed pastors who were liars, adulterers, or even murderers, but that’s not Pastor Chris’ problem. He seems to be a good guy, except briefly when things are going well at the church and he gets a little full of himself. But, as mentioned before, he is a horrible, dull preacher. He seems devoid of counseling or leadership skills. I didn’t notice many theological shortcomings, because I couldn’t discern much theological thinking. He does quote his wife frequently, and she always says, “God won’t give us more than we can handle.” That statement could use more explaining and back-up from Scripture. Perhaps the screen version of Pastor Chris should have considered a job in law enforcement. Also bringing down the steeple rating: a church choir that can’t stay on key for a rendition of “This Little Light of Mine.” Your average kindergarten Sunday School class does a better job on the song. 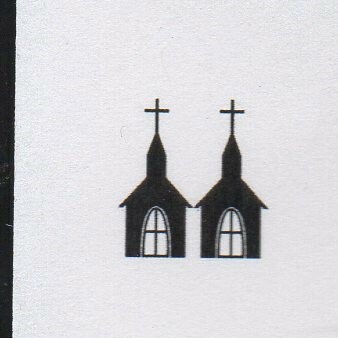 We’re giving Chris and his church a rating of Two Steeples.